Buena Vista was running at The Festival for the sixth year in succession and after a number of game efforts over the years, most notably a third in the 2006 Supreme Novices’ Hurdle and a second in this race last year, finally gained a deserved victory when making nearly all to land the 2010 Pertemps Final Handicap Hurdle. Partnered by Hadden Frost, riding his first Festival winner, Buena Vista saw off the challenges of first Chamirey and then Prince Erik to score by five lengths at 16/1. The nine-year-old is owned by Matt Archer, who is based in Cyprus, and the family of the late Jean Broadhurst, who passed away five years ago, and there were tears and lots of emotion in the winner’s enclosure. Successful trainer David Pipe said: “What can I say about this horse? 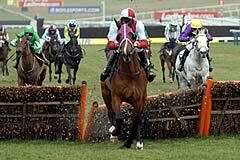 I think this is about the sixth time and he has run in the Bumper, the Supreme and the Arkle over the years. “Now that he is older, he wants further and I wasn’t sure at first whether we should run today or wait for dad’s race (the Martin Pipe Conditional Jockeys’ Handicap Hurdle) tomorrow. “The key to this horse is that he wants better ground and when I looked at the weather forecast I decided that we should run today. “It wasn’t the plan to go off in front but Hadden has done the right thing and let him bowl along. “It’s a long way home here when you are out in front but fortunately he kept going. “He has always been a decent horse and is part of the furniture at Pond House. He is a very straightforward horse. He can be a bit grumpy and keeps himself to himself but loves his grub. Hadden Frost, the son of former jockey Jimmy Frost who now trains, emulated his father by winning at The Festival on Buena Vista in the Pertemps Final. Buena Vista, running in his sixth Festival contest and second in this race last year, benefited from a positive ride. Frost junior said: “It may have been Buena Vista’s sixth run at The Festival but he has always gone close. He is so gallant and gutsy. “David (Pipe - the trainer) and connections have done well to get him here today - he is a consistent horse - and I would like to thank them for the opportunity to ride this horse. “The blinkers just woke him up and he jumped well the whole time. You spend your whole childhood dreaming of winning at The Festival and it is just a dream. Then it comes true and you don’t know how to describe it. “The Cheltenham roar is awesome - I want it again. Jimmy Frost rode three winners at The Festival - most notable winning the Champion Hurdle on Morley Street in 1991. Trainer Dermot Weld had his final runner at this year’s Festival with Prince Erik in the Pertemps Final Handicap Hurdle, and the horse acquitted himself well, finishing second to Buena Vista, beaten by five lengths. Weld said: “He stayed on very well, we were delighted with his performance. He followed up his good run at Leopardstown. He ran a lovely race and got a cracking ride from Robbie Power. We just met a horse that was too good for us today. “I was hoping that the winner might run out of steam coming up the hill, but that doesn’t often happen with a Pipe horse. He’ll probably go back to a Flat handicap next. “I’m leaving now because of a busy weekend at The Curragh. The horses have run very well. Elegant Concorde was badly hurt in the bumper yesterday. That was the only problem. I think the favourite came in on him coming up the hill and bumped him against the rails so he’s a pretty sore horse,” he added. Nothing could live with all-the-way winner Buena Vista in the Pertemps Final, but Chamirey ran a fine race, tracking the leader for much of the race before taking a valuable third place. Chamirey was ridden by Wayne Hutchinson, because Alan King’s stable jockey, Choc Thornton elected to ride Trenchant, who finished sixteenth. Barry Simpson, racing manager to Chamirey’s owner, Sir Robert Ogden, said: “He’s run very, very well. Blinkers [applied for the first time] sharpened him up and he jumped very well and accurately. “He came off the bridle coming down and made a mistake at the second-last which may have cost him second place. I doubt he would have pegged back the winner in any case, but they went an end-to-end gallop and he stayed on.